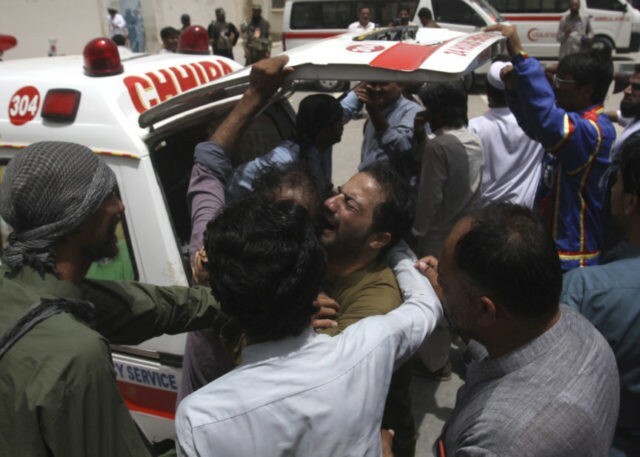 Pakistan experienced multiple violent incidents, including a suicide bombing that killed at least 31, on Wednesday as the nation took to the polls for regional legislative elections. With hundreds of legislative seats and local positions up for grabs, the election has attracted the ire of several radical Islamic terrorist groups, including the Islamic State, which claimed the Quetta suicide bombing. According to the Agence France-Presse (AFP), police in Quetta stopped a man from entering a polling station in the Eastern Bypass area of the city. Prevented from entering the voting area, the man blew himself up in front of the building, killing 31 and injuring over 30 others, both police and civilians. AFP notes that eight of those who survived the blast are in critical condition. “(The bomber) was trying to enter the polling station. When police tried to stop him he blew himself up,” Hashim Ghilzai, a local official, told AFP. Police cleaned up the crime scene and allowed citizens to continue voting at the school the bomber targeted, which apparently did not suffer any significant damage. The Islamic State—which has lost significant ground in its former home base of Iraq and Syria but has flourished in Afghanistan—took responsibility for the Quetta attack. The Pakistani newspaper Dawn listed at least seven other incidents of violence around the country, most involving clashes between opposing political parties. The elections are being primarily contested between two major parties—the Pakistan Muslim League-Nawaz (PML-N), party of former prime minister Nawaz Sharif, and the Pakistan Tehreek-e-Insaf (PTI), party of former cricket star Imran Khan. The elections have also attracted parties such as the Lashkar-e-Taiba (LeT) and Lashkar-i -Hangvi (LJ), however, which have ties to radical Islamist groups. Dawn lists multiple violent clashes occurring between members of the PTI and the minority Awami National Party (ANP) in Khyber Pakhtunkhwa’s (KP) Swabi district and Mardan. A PTI partisan died in the KP incident, but police recorded only injuries in Mardan. Police were also reportedly forced to stop polling in several parts of Kohistan, a district in KP province, over “a scuffle between supporters of two independent candidates” in both cases. In Jijal, Kohistan, at least seven were hospitalized following the fight. In Punjab, Dawn reports that at least one man was shot dead in a clash between unspecified political groups, and a separate incident also triggered injuries. Dawn also noted a violent altercation in Balochistan at press time. Pakistani police and military had prepared for a violent election. The Pakistani Election Commission worked with police and military to ensure that 800,000 security officials and nearly 400,000 soldiers were dispatched nationwide to protect polling places from violence and fraud. Authorities had good reason to suspect violence: this campaign season had been among the most violent in the nation’s history. Nearly two weeks ago, Pakistan experienced its deadliest terrorist attack since 2014 at a campaign rally in Balochistan. Islamic State suicide bombers killed 128 people, including a candidate for an open regional seat, and injured over 200 others at a rally for Nawabzada Siraj Raisani, who did not survive the attack. Also raising some alarm is the possibility of fraud. As Pakistan’s Express Tribune noted on Wednesday, election officials have expressed concern that, in Punjab province specifically, vote counters may have to contend with a “possible failure” of the system used to transfer votes to a central database in Islamabad and count them all. “Just a day before polling, returning officers from Faisalabad, Okara and other cities wrote separate letters to the National Database and Registration Authority (NADRA)—the manufacturer of Android application, which will enable election officers to send election results to the Election Commission of Pakistan in real time—complaining” about the system, the Tribune noted, suggesting little was done to address the concerns. As of press time, polls have closed nationwide, but officials have not yet begun publishing vote counts. The PML-N has already begun filing “large-scale nationwide complaints” arguing that its supporters were banned from voting or forced to wait unreasonable hours to cast their ballots, demanding polls stay open for longer. There is no indication the Election Commission has ceded to that request, however. The Express Tribune has begun printing unofficial results for local elections.